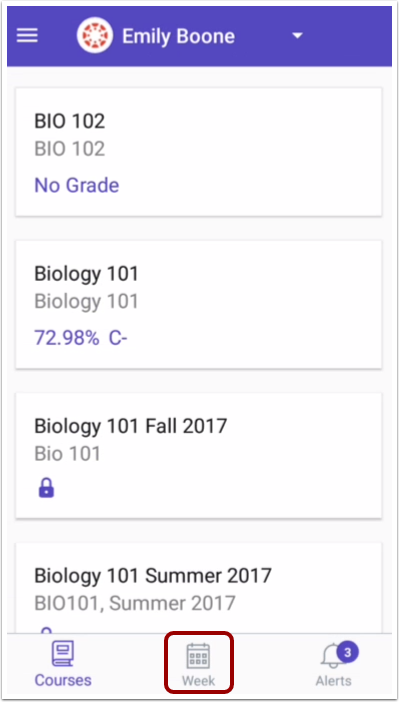 How do I view the calendar of assignments and events for a student in the Canvas Parent app on my Android device? The Week page displays a calendar of assignments and events for the student(s) you are observing. The Week page shows all assignments and events for all the student's courses. By default, assignments and events are shown by week. To view other assignments and events for all courses by week, tap the back or next arrows. 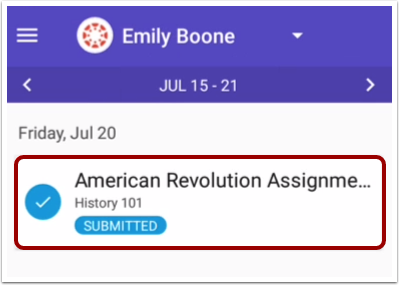 To view the details of an individual assignment or event, tap the name of the assignment or event. Previous Topic:How do I view courses for a student in the Canvas Parent app on my Android device? 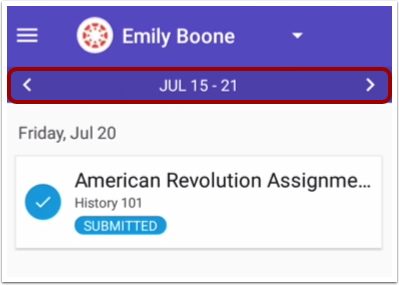 Next Topic:How do I create a reminder for an assignment or event in the Canvas Parent app on my Android device? Table of Contents > Observers > How do I view the calendar of assignments and events for a student in the Canvas Parent app on my Android device?